The Screw tool uses two points given by the open line to create an initial vector to calculate the height and basic angle of the translation vector that is added to the "Spin" for each full rotation (see examples below). 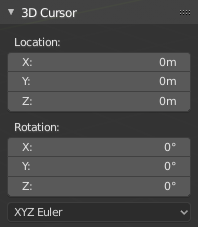 If the vector is created with only two vertices at the same XYZ location (which will not give Blender a vector value for height), this will create a normal "Spin". There are strict conditions about the profile selection when you want to use this tool. You must have at least one open line or open profile, giving Blender the starting Vector for extrusion, angular vector and height (e.g. a simple edge, a half circle, etc.). You need only to ensure that at least one reference line has two "free" ends. If two open Lines are given, Blender will not determine which of them is the vector, and will then show you an error message, "You have to select a string of connected vertices too". You need to select all of the profile vertices that will participate in the Screw Tool operation; if they are not properly selected, Blender will also show you the same message. Note that the open line is always extruded, so if you only use it to "guide" the screw, you will have to delete it after the tool completion (use linked-selection, Ctrl-L, to select the whole extrusion of the open line). You may have as many profiles as you like (like circles, squares, and so on) -- Note that, not all vertices in a profile need to be in the same plane, even if this is the most common case. You may also have other, more complex, selected closed islands, but they have to be closed profiles because Blender will seek for only one open profile for the translation, height and angular vector. Some closed meshes that overlap themselves may not screw correctly (for example: Half UV Sphere works fine, but more than half could cause the Screw Tool to have wrong behavior or errors), and profiles that are closed with faces (like a cone or half sphere) will be closed automatically at their ends, like if you were extruding a region. At this point, you can save this blend-file to recycle the Spring for another exercise; LMB click on File, located in the header of the Info editor, (at the top left side), and choose Save as. You can name it e.g. "screw spring example.blend". Open Blender and click on File located in the header of the Info editor again, choose Open Recent and the file you saved for this exercise. All of the things will be placed exactly the way you saved before. Choose the last saved blend-file; in the last exercise, you gave it the name "screw spring example.blend". At this point, you can save this blend-file to recycle the generated Screw for another exercise; click with LMB on File -- it is in the header of the Info editor (at the top left side), and choose Save as. You can name it e.g. "screw hardware example.blend". Open Blender and click on File located in the header of the Info editor again; choose Open Recent and the file saved for this exercise. All of the things will be placed exactly the way you saved before. Choose the last saved blend-file; from the last exercise, which is named "screw hardware example.blend".